~ ~ There are often historical remembrance events that make one want to know what were the true facts for people who roamed Tombstone & the Old West. What was their life like? What tools did they use? ~ ~ 2ND - Gunfighter Hall of Fame Museum Visited here quite a while back. ~ ~ But not lately. It is a terrific museum. Highly recommend you go there, if possible. A question to us from a website visitor with a concern spurred another look over there. ~ ~ The thing is - when is it open? Seems like you could go there on several occasions & it won't be open. There aren't any hours posted. This day when we stopped, it was open - & the owner was there. So we spoke with him. ~ ~ He said he doesn't have employees, it's open when he gets there. That can be 7 days/week, from morning til 5 pm. But if he has to get something done: an appt., family emergency, to town for supplies, etc. - then he won't be there while taking care of those things. That's why he doesn't post hours. ~ ~ Therefore when you're in town & want to see this museum, it can be hit or miss. He says he can't help it - he has to run it this way. If you luck out - it's an $8 entry fee. A lot of worthwhile things to see, though. 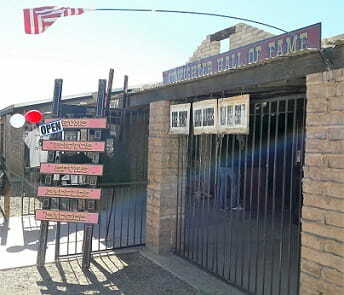 Open Today in Tombstone Arizona! 2019 CALENDAR SAVINGS & MORE! ~ ~ Our Tombstone Custom Calendar is still available at the special link below only for our subscribers. We had to adjust the original price to be able to get the most savings for the final price. Still available for a little while longer - a few more months - while we work on this other deal. ~ ~ When we get it finished, a different calendar deal for subscribers will be downloadable. Not quite as nice as the purchased one - unless you have a super printer! But you can print it out for free! !